It's Easter, and while everyone with any sense is with their family, hunting 'streggs, stuffing their faces with new season lamb, and wondering what to do with the one Sunday of the year when the Cathedrals of Commerce are closed, I'm at my desk making a determined effort to reduce the tower of 2014 paving and landscaping brochures to below the 100mm mark, and this week's victim is Brett Paving. Over the last few years, of the scores of brochures and catalogues that land on my doormat, Brett has been the one that has pushed forward the style and format of the genre more than any other. The easy-going, friendly, magazine-like informality, the browsability, the coffee-table relaxed feel would not have been out of place in a dentist's surgery or railway waiting room. 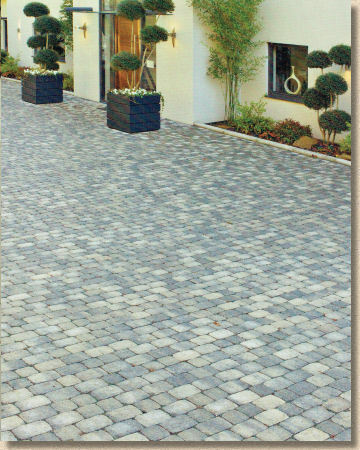 It sold paving without ever giving the sense that it was selling paving. But for how long can that format continue? Do you work on the principle of not fixing what ain't broke, or should you never rest on your laurels? Changes in the management and marketing team at Brett inevitably meant that there would be some changes to the brochure, and we witnessed the start of that process last year. Will 2014 see further gradual evolution or a wholesale re-think? The answer is both, which may seem contradictory, but the scale of changes depends on what it is being considered. 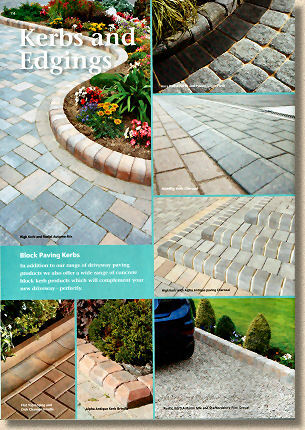 The brochure has evolved, that's for sure, but the product range has be re-structured on a compass-altering level, with the needle swinging violently away from Brett's traditional comfort zone of concrete product through slightly more than 90 degrees to imported natural stone. 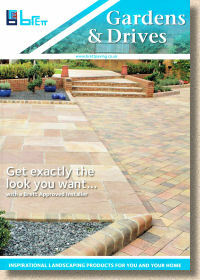 It's been a long time coming, which is largely due to the company's history and commitment to concrete and aggregates over many decades, but it's taken a change of management for the company as a whole to realise that the market, particularly that for patios and driveways, has moved on and moved away from concrete and is now very definitely mired in the flood of imported stone. In fact, there's an argument to be made that the first signs of the market moving on yet again as there are some exciting stirrings in the next generation concrete products, so maybe Brett's late-in-the-day Damascene conversion may be just that: late. The message from Brett, both in their brochure and at the Installer Awards and Conference back in February, is very much that they are now fully committed to natural stone, and that message is backed up by the addition of new products which, for me, offer varying levels of temptation. 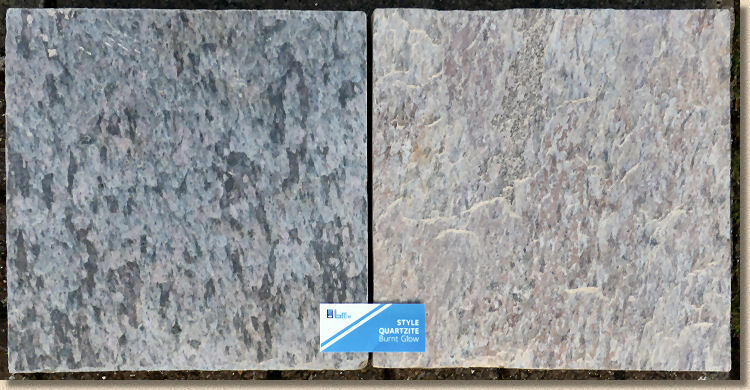 For instance, the quartzite Burnt Glow with warm, mottled tones, is intriguing and subtle and attractive, while the Midnight Storm, with its bold banding is too strong for my taste, striking you might say, but too likely to dominate a patio rather than provide a pleasant but not distracting backdrop. 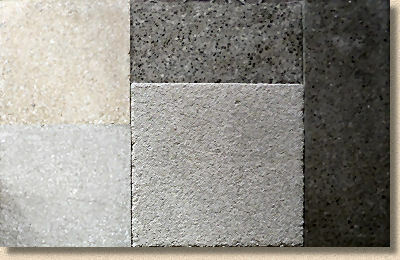 The whole of the natural stone menu has been divided into four groups: The Elite group features high-value secondary processed stone; Creative houses the calibrated sandstone; Smart is for the more familiar riven materials and finally Style is.....well, it seems to be a bit of everything. To be honest, the groupings aren't all that clear and I'm not completely sure how it is supposed to help. It's just confused me and made it harder to locate the stone I wanted! There is some lovely stone in amongst these ill-defined groupings but there's not much that we haven't seen before from elsewhere, and it seems to me that if you want to declare your intentions as a serious supplier for imported stone, you have to offer three or four gob-smackers; stone that isn't available from anyone else, but is a real head-turner. Admittedly the blousy Midnight Storm will turn heads, but will they be turned for the right reasons? 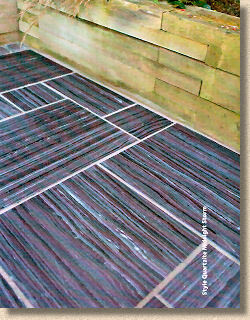 The Burnt Glow Quartzite is the standout product for me, but one product is not enough to carry a range. There has to be more. Maybe it's early days and the range will be refined and expanded by next year. What's available at the moment is generic, and with so much competition out there, you have to be offering something special, in terms of price or after-sales service, if you want to attract customers. It's almost impossible for a supplier such as Brett to beat the auction site, container-in-a-yard sellers who buy cheap second-rate stuff, sell it cheap and offer no technical back-up or after sales. Brett can beat them hands down on technical and support, but is that enough? I've no doubt the better class of contractor, as epitomised by the Brett Approved Installer (BAI) will be happy enough to pay a few bob extra for that guaranteed quality and sales support, but what about the occasional flagger, the landscaper who lays two or three patios a year? What about the DIYer? Is there enough to persuade them to buy Brett branded stone? Time will tell, as it usually does, but they desperately need another couple of head-turners, something that no-one else is offering, something that will excites designers and entice homeowners. 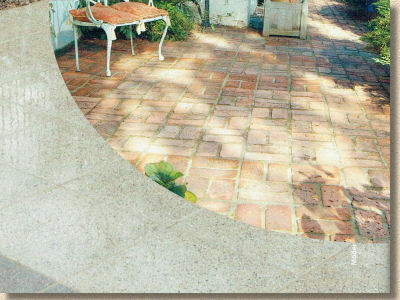 Meanwhile, back on Brett's more familiar territory of concrete patio products, everything is pretty much as we'd expect: a wide and eclectic range from ultra-chic polished Moderno to yesteryear's wet-cast Old English Brick. 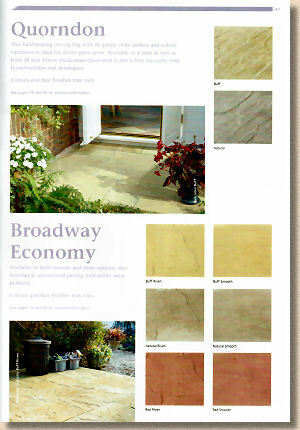 The only new product is Stamford a self-declared 'economy' wet-cast flagstone with a softer riven finish. Two colours, buff and natural (ie: plain concrete grey) and only two sizes, both squares, 450x450mm and 600x600mm, which makes it an ultra-basic flag with almost nothing to offer other than low price. 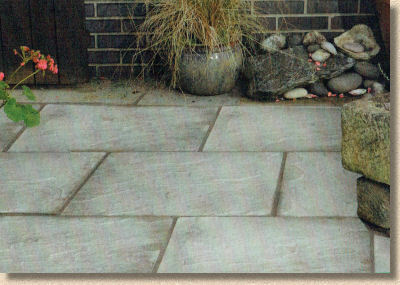 Is this really the future for concrete flagstones? I see other concrete paving manufacturers experimenting with new techniques, new finishes, new colour schemes, new sizes, while Brett are offering a cheaper version of what we already know we don't really want. Admittedly, some of the innovative products from elsewhere will sink without trace, but at least they were given a chance, and for that, we have to be grateful, for it is from these toe-dipping efforts that the next generation of 'classics' will emerge. 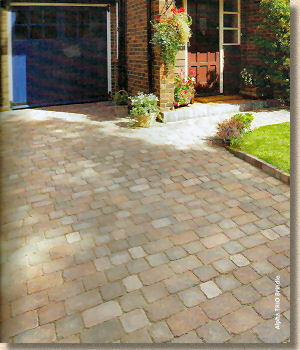 And even in what many would regard as Brett's strongest hand, the concrete block paving, there's nothing new worthy of note. Oh yes, there's Alpha Trio, but that's just the familiar and best-selling Alpha re-packaged to put 3 sizes in one pack. That's handy for DIYers and landscapers undertaking smaller projects, but it's of no real interest to serious paving contractors. Will any of these ever see full release? Again, where is the innovation? Where is there something about which we can get excited and look forward to installing? A couple of 'in development' products, flags and blocks, were shown on a teeny-weeny scale at the BAI awards night, and they did look interesting, but they should be market ready by now. 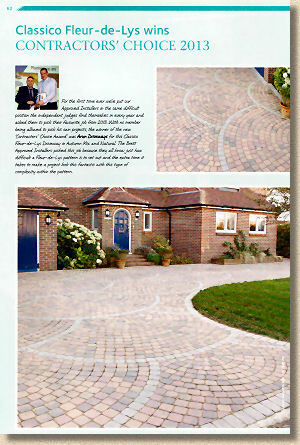 The truly successful paving manufacturers develop a lot of that success by creating brand loyalty. I know contractors who proudly proclaim that, if you were to cut them, they'd bleed Marshalls or Plasmor or Charcon or whoever, and there are plenty contractors who profess to bleed Brett. However, that degree of loyalty relies on the contractor being provided with a steady flow of reliable yet innovative products. When there's nowt new to show clients, a sense of staleness sets in, and even the most true-blooded contractor starts to look around at what the others are offering. As with the stone, the basic menu is all there but the sauce to add piquancy and flavour is missing. Enough about the products, what about the brochure itself? Well, there's less of that magazine informality and more a sense of sliding back to standard brochure fare, which is disappointing but is just about forgivable because the photies are so damned good. This is no accident: the reason the photies *are* so good is that the bulk of them are provided by the elite within the BAI list. They are showpiece jobs; they are award winners; they are genuine head-turners. The paving has been laid with the intention of presenting it to best effect, making it photie-friendly, with very few errors or naughty-bits for pedants such as I to pick on. This has dual benefits. Not only are Brett's paving products shown at their best, in fantastic designs with impeccable installation standards, but the BAI installers are simultaneously promoted, given a showcase for their work which is the best promotion an ambitious contractor can receive. The installers are fully credited for each image, so there is a symbiotic relationship, where both manufacturer and contractor are mutually benefitting, and it works so well. 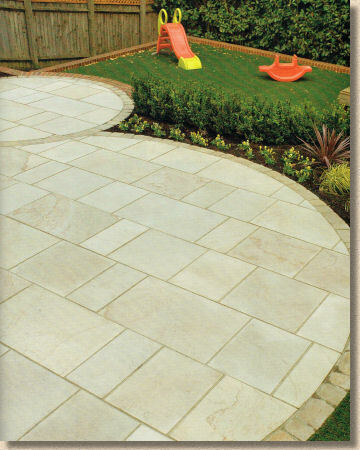 In fact, throughout the brochure, BAI installers are 'bigged-up' as the young 'uns say, so the customer browsing the Brett brochure not only gets to see the paving that's perfect for their project, but there's a direct lead to a suitably experienced contractor who could install it for them. And key to making the most of this symbiosis is getting the work professionally photographed. Brett may well be brilliant at making paving, and the contractors may well be at the top of the tree when it comes to installing, but neither are natural photographers, and I've seen from my work on the judging panel for the BAI awards just how much difference a good photie can make. Paving obsessive such as me can usually spot a good job behind the veil of a poor photie, but when you see that same job are captured by someone with a true togfer's eye, then the difference can shock you. So, plenty of mentions for the BAI, backed up with plenty of truly good images, but how is it all tied together to make a brochure? This is where the weakness creeps in. By loosening the magazine formula, too many pages have regressed to being assemblages of photies and text. The feature pages showcasing award winners are what saves it because they break the monotony. Standard pages are pastel-coloured with the text in the same hue just a few shades darker, which gives it all a sort of wishy-washy look. Many pages are table-format rectangles of text and images, yet others are much more artful, featuring multi-sized photies in collage style, which is much more effective. Technical information is shoved to the back, leaving product pages relatively uncluttered, but I prefer to be given basic size info alongside the paving in question, rather than have to thumb through to the back and decipher some confusing matrix which attempts to coverall all products in all permutations in one page. I don't mind having pack sizes or circle formats or step combinations tucked away in technical pages, but it's useful to able to see immediately just what sizes of a particular block or flag are on offer. The 'How To...' info is basic, but generally accurate. I do wonder how useful such concise guides can be. 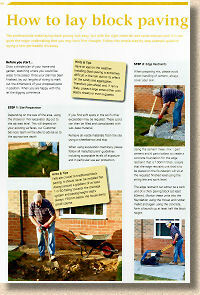 Has anyone actually made a success of their patio or driveway following only the advice given in these guides? I suppose they help DIYers assess whether their next project really is within their capabilities, but I worry that showing a bloke on his own digging off for his block paving using a spade and a barrow might be misleading when he's faced with a 120m² driveway! So: how to sum up? I sense 2014 is a year of stasis for Brett. There's nothing radically new or exciting in the products, it's all very much 'steady as she goes', and the brochure, which should act as a mainsail to propel the ship onwards, is beginning to droop ever so slightly. With a good following wind, the barque will sail on, but once over the horizon into 2015, we need to see new vistas otherwise there may well be rumblings of mutiny amongst even those considered loyal and true to the Brett brand. As ever, Brett's main customer base lies south and east of a line from Hull to Bristol, so anyone plying their trade in that part of the country, if they don't already have copies of the 2014 brochure, should avail themselves of the link below immediately because you are missing some great products and some stupendous project photies. For those of us north and west of the line, it's still worth checking out what our southern neighbours are up to. Even if you can't get your mitts on the products, you will find some photies in there that *will* inspire your upcoming projects.